Megilas Esther is famous for being the only sefer in Tanach with no mention of Hashem’s name. The Gemara in Chullin sees Hashem’s subtlety as central to the story of Esther. The Gemara (139a) asks, “Where does the Torah make mention of Esther?” and answers by citing the pasuk (Devarim 31:18) “v’anochi hastir astir pani bayom hahu” — and I will hide my face on that day. What is the significance of Hashem’s subtlety in story of Purim and how can we use this knowledge to be better ovdei Hashem? Perhaps the idea of subtlety can be better understood in relation to another theme of Purim, namely, kabalas hatorah. 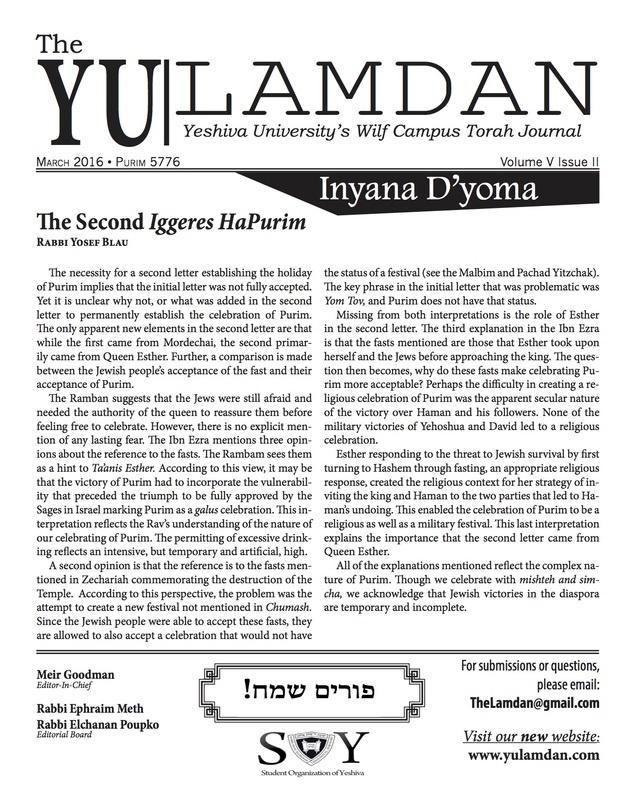 The Gemara in Shabbos (88a) says that there was a second kabalas hatorah on Purim. The first kabalas hatorah was lacking because Hashem coerced klal yisrael to accept the Torah, while the second kabalas hatorah was performed willingly and out of love (as explained by Rashi there). The Meshech Chochma (Shemos 19:17) suggests that the coercion of the first kabbalas hatorah was not physical coercion. Rather, klal Yisrael was so overwhelmed by Hashem’s revelation that they couldn’t act out of their own free will; they could not help but accept the Torah. The limitedness of this overt revelation may have contributed to klal Yisrael’s swift fall from greatness in the chiet ha’eigel. According to the Ramban (Shemos 32:1), klal Yisrael in building the eigel had no intention to replace Hashem with avodah zarah. Rather, in Moshe’s absence, they were looking for a leader. They seized on the image of an eigel, because they had seen an image of an ox on Hashem’s heavenly throne when He appeared before them on Har Sinai. The cheit ha’eigel was not an attempt to replace Hashem, but to connect with Him by recreating some of the giluy shechinah experienced at Har Sinai. The cheit ha’eigel points to the precariousness of a kaballas haTorah rooted in open revelation. In contrast, the hidden hand of Hashem in the times of Purim led to a deeper kaballas hatorah, which would continue to endure even in the absence of giluy shechinah. In our own lives, what can we do to continue to experience the revelation of Purim? How do we work to perceive Hashem even when he is hidden? Rav Wolbe (Alei Shur Vol. 2, Chap. 25) suggests that we work on developing the middah of tznius. Rav Wolbe, citing the Maharal, explains that Esther Hamalka excelled in the middah of tznius (see Megillah 13b). Esther’s tznius, explains Rav Wolbe, was exemplified by “ain Esther magedes es moladata v’es ama…” – Esther would not reveal her birthplace or nation (Esther 2:20). Even at the center of the public eye, as queen of a vast empire, Esther remained a private person, revealing as little as possible about herself to others. Because Esther excelled at being hidden she was uniquely able to perceive Hashem’s hidden hashgacha and as such she was chosen to lead klal Yisrael to find Hashem in a time of hester. By developing our own middah of tznius, Rav Wolbe suggests, we too can learn to perceive Hashem even in His subtlety. How exactly does developing our own tznius lead to recognition of Hashem in His subtlety? Perhaps we can shed light on this idea by suggesting a practical example. Like Esther, many of us develop a public image. For example, we may have to compile a resume for work purposes and develop a manner of presenting ourselves to potential employers. In this process, we have to develop a sense of what we have to offer in the prospective position and how to best convey this to a potential employer. While this process is critical for our future employment, it may contain certain pitfalls. What if we buy into our own image a little too much? What if we begin to focus too much on our capabilities and successes within a certain skill set and lose sight of some of the hidden beauty of our characters and personalities? To prevent this from happening, it may be worthwhile to hold back just a little, to not put all that we have to offer on display for others. As a result, we may become more attuned to and in touch with whom we are under the surface, what really matters to us and what really motivates us. By getting and staying in touch with our hidden, inner selves, we may also become more attuned to Hashem’s subtlety. We see a world in which anti-Semitism is on the rise. We see an American society that seems to have no place for kedushah. We see a Jewish community which often seems plagued by corruption and infighting. It may be difficult to see that everything is directed by Hashem. But if we train ourselves to not overplay our own externalities, to live deeper more inner lives, we may better appreciate that in the world around us there is much more that meets the eye. By developing tznius in ourselves, we may better appreciate Hashem’s hidden shepherding of our world.